If you happen to be a music enthusiast you understand that better audio equipment is necessary to enjoy music across all spectrums. That’s why we’re narrowing down the market to the five best bookshelf speakers under $500. They’re a great option when it comes to aesthetics, smooth music, and pairing with special features in a home setting. 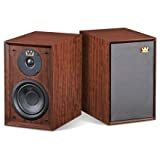 Before jumping into the list, let’s get further into why bookshelf speakers are such a great investment for any of our readers, audiophile or not. Stereo speakers under $500 are the best budget-ranged speakers for finding a balance of quality and output. They’re perfectly suited to be a part of your home system, although if desired they can also serve users in other capacities. 1. They don’t compromise on quality as some of the products in the $100-$150 range do. 2. The budget of under $500 is reasonable for most people. We’re not asking you to break the bank at a few thousand! Like many of our readers, we understand that finances don’t always allow for luxury – but that doesn’t mean you should sacrifice quality. 3. Bookshelf speakers under $500 generally produce high-quality sound great for personal stereo system use or close listening. Now that we’ve established why this price point could be the best for you, let’s get down to the finer details of our top 5 bookshelf speakers. The Pioneer Elite SP-EBS73 is designed by world-renowned speaker engineer Andrew Jones. The Dolby-Atmos technology that it comes with will elevate your sound-system to new heights. With these speakers on board, listeners get a sense of 3D space that’ll put you deep into the listening experience. Elite SP-EBS73s are suitable to use as both front-channel as well as rear-channel. These happen to be an extraordinarily designed speaker set with a beautifully curved style. They also have a top firing concentric driver that ensures music doesn’t get muddled due to any obstructions around the devices. While many compact speakers compromise performance in the way of design, Pioneer Elite SP-EBS73’s three-way design ensures that each major frequency band is represented with a separate high, mid-range, and low-frequency driver. The black design looks simply elegant, and stands out from other run-of-the-mill styles of other speakers. Even without its protective padding the speakers have a certain flair to them. At 15 inches long and 10 inches wide, the EBS73s are actually a bit larger than most other bookshelf speakers. They produce a total power output of 140 Watts and with an impedance of just 4 Ohms. Make sure to check out its full review here. The speakers can be enhanced with a subwoofer, center channeled speaker, or a floor standing loudspeaker. You may also want to consider buying speaker stands for these and turning them into an attention-grabber in your home. Technically speaking Bowers & Wilkins MM-1s aren’t bookshelf speakers, but they do mimic the design and so we’ve decided to include them here. Bowers & Wilkins MM-1s stand out in their design. Elegant and simple, they draw the eye in any room. This device has a built in DAC that handles the digital to analogue conversion, eliminating the need to buy an external digital audio converter. MM-1s are specifically designed for use alongside a desktop computer and are made for a detail-rich sound at close proximity. BUILT-IN DAC FOR QUALITY SOUND - Stream audio directly from your computer via USB, which converts the signal from digital to analog internally. The MM-1 also feature an aux line-in socket for connecting other devices. FULL-RANGE SOUND - Most computer speakers have just one drive unit to handle all frequencies. MM-1 has two drivers, one dedicated to bass and midrange frequencies and another for treble. It sounds like a Hi-Fi speaker, because it is one. 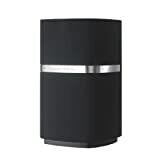 2 YEAR LIMITED WARRANTY - Bowers & Wilkins' MM1 Hi-Fi Speakers come with a 2-year limited warranty only when purchased from an authorized dealer including Amazon.com (indicated by ships from and sold by Amazon.com). Please Note: Kindly refer the Instructional Video before use. The 3 inch woofers and 1 inched tweeters, although small in size, produce relatively high quality sound. Also, the MM-1s digital signal processing (DSP) technology constantly adjusts sound balance to keep bass effects powerful and music sounding rich and detailed no matter how loud you play it. The speakers come with a 3.5mm mini jack input slot as well as a USB 2.0 port to connect to your PC. Bowers and Wilkins excels in keeping the design minimal with the wire setup at the bottom of the speakers, ensuring that the overall look is clean and put together. They can handle all genres of music from hip hop to rap, heavy metal to classical, and play well with acoustic too. Consumers will identify the Wharfedale Denton as a beast on first sight. 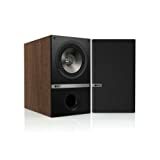 It’s easily one of the largest speaker sets on our list at 12.6 inches tall, 7.8 inches wide and 10.8 inches deep. Weighing at almost 40 pounds, the Dentons may be the heaviest on our list as well. The bass unit features Wharfedale’s innovative woven Kevlar cone, mounted on a rigid die-cast chassis, a combination made to deliver a rich, detailed bass and a mid-range output with superb dynamic performance. The design includes a classy cabinet finish of mahogany red veneer masked by a grey tungsten cloth grille. Dimensions: 12.6" x 7.8" x 10.8"
This product happens to be Wharfedale’s 80th anniversary edition speakers and are backed up by almost a century of experience in enhancing the audio industry. On first listen they may not sound that great as they require a certain burn-in time for the audio to really kick in. We recommend getting an excellent amp like this one and a set of excellent cables, as these additions can affect the sound drastically. This product is one of our personal favorites on the list. With custom Kevlar woofers, silk dome tweeters, and hand-built cabinets, the Audioengine A5+ is a beast with a highly coordinated, buzz-worthy design that surely justifies its price. The package includes a remote control, dual audio inputs, and enhanced thermal management features. 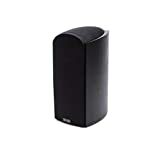 It is 10.75 inches in height and 7.75 inches in width, making it the perfect sized bookshelf speaker set compared to other in this list. They fit in most out-of-the-way places if you’re not looking to make your audio equipment the centerpiece of a room. Despite their smaller size, the A5+ lean heavily toward any audio using a lot of bass. But they don’t try to over enhance the original audio – instead, Audioengine is well known for coming close to the original intentions of the audio. Whether you’re listening to music or watching movies, you’ll get tight, punchy bass with a growl that is bound to put a smile on your face no matter the volume level. Check out the full product review. One intriguing aspect of these speakers is the external heat sink that allows heat to easily dissipate from the speakers, making sure they run efficiently for a longer time. The A5+s come in three colors: white, black and red. There’s also another version carved from bamboo at a slightly higher price, however the sound quality response well to this material. KEF are known for their premium audio products ranging from $400 to $7000. What sets the KEF Q100s apart from other speakers on this list is the KEF Uni-Q driver, gold-plated bi-wire terminals, and 30% more cabinet space for increased bass performance. The company’s new bass drivers feature rigid aluminum core technology that’s specially designed to enhance the woofer’s performance. KEF Q100s can be used as main speakers, music speakers, rear or general speakers. Their flexibility opens up a world of quality sound at affordable price. We rarely get such loud speakers under $500. Allow the KEF Q100 to re-introduce you to all your favorite music and moves, though with nuance and depth you've never quite heard before. These bookshelf speakers are large enough to command a home theater setup with ease, yet compact enough for any modest listening room or home office. The Q100 prominently features KEF's Uni-Q driver array, which is designed to produce an exceptionally accurate, three-dimensional soundstage that evenly envelopes any room. The Q100 features a 5.25" inch Uni-Q driver array with a 1" vented dome tweeter in the center. The driver array handles frequencies from 49Hz to 40kHz from a single source. The Q100 Bookshelf Speakers are sold in pairs. They come in at a height of 11.8 inches and a 7 inch width, generating a sound frequency between 50 and 40,000 hertz. This is more than enough to enjoy music from a wide spectrum! The sound they produce is even more surprising: spacious and precisely detailed, with compelling midranges and high-frequency response. The design of this product is slightly different than others on the market as the tweeters are towards the bottom and the bass driver is towards the top of the cabinet. These speakers manage to look elegant even without the speaker grill. KEF has purposely made the cabinet larger on the Q100 so as to provide a more full acoustic sound. The range of good bookshelf speakers begins at around $100 and affordability, for most people, ends at around $500. There’s obviously going to be a difference in quality as you move along that sliding scale, but we’ve done our best to include multiple options based on what our consumers may be able to afford and what they’re looking for in a speaker. All of the above products, at under $500, are a great buy as far as quality and design.